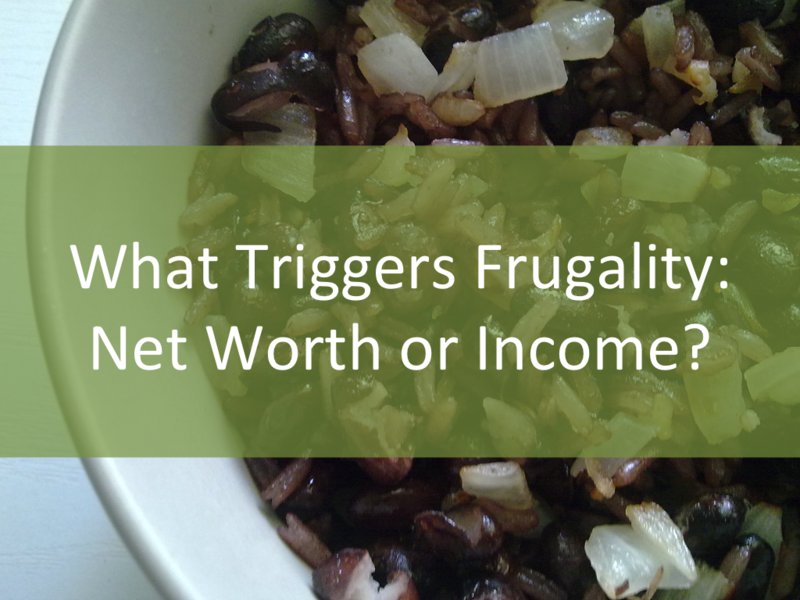 What Triggers Frugality: Net Worth or Income? My mindset toward frugality has changed quite a bit even during the few short years I’ve been blogging. While I’ve never felt poor, Kyle and I used to be very careful with our money. I mean, we would still do a lot of things like travel domestically and pay for entertainment, but we would be very deliberate and tight in how we went about it. We traveled to Chicago to attend a wedding, for instance, but road-tripped instead of flying and brought a cooler full of food. We started our system of targeted savings accounts so that spending $200 on season basketball tickets wouldn’t feel like such a shock. At that time, our net worth was around $25,000-40,000, and our income was about $50,000. The vast majority of that net worth, though, was in our retirement accounts. By the end of grad school, we weren’t forcing frugality so much. We made some one-time decisions that helped us spend less money and have some ingrained frugal habits like defaulting to eating at home. But we dropped all the practices that might help us reduce spending if they felt too inconvenient, and we didn’t mind spending money when we chose to. Because of our busyness leading up to our defenses, we moved more toward my definition of frugality (we didn’t do as much, but spent more freely when we chose to) rather than Kyle’s definition of frugality (trying to do and buy more things, but getting the best deal possible). If we annualized our income from the last few months, it would be around $45,000. Yet our net worth is over $100,000. Net worth clearly seems to matter more to my psychology than income. I feel so much more secure now and don’t feel the need to force frugality. Our cash flow may be smaller, but covering our necessities has never really been the issue for us – it’s how we should go about paying for the irregular expenses like trips and big purchases. Because of our system of targeted savings accounts, those kinds of purchases have always come out of short-term savings, and right now we have a much higher balance than we had a few years ago. I’m so glad that I’m enjoying my funemployment (how can I get paid to keep doing this??) and that Kyle isn’t feeling resentment over being the sole breadwinner. I think the situation would be totally different, of course, if we didn’t have that high net worth/big pile of cash savings to tide us over. If we were back to fairly low cash savings and a lower income, I’d probably be going insane with frugality and trying to earn extra money. What triggers frugality in your life – dwindling savings or lower income? Do you feel you are forcing frugality now or is everything you do second nature? What’s the Point of Calculating Net Worth? Can a Net Income Boost Compensate for Not Having Earned Income? 38 Responses to "What Triggers Frugality: Net Worth or Income?" Not just net worth but cash at hand. Yep, cash on hand to make those irregular purchases, absolutely. Is that $45,000 over the last few months worded properly? If we were pulling in $45,000 in a couple months I’d hope to have more net worth than $100,000! We don’t have all the frugal habits down yet. We still like to eat out and such. But overall the big stuff is taken care of, so we just keep working on the little stuff. We’re a single income family and I prefer to focus on our net worth. Income’s no good if there’s nothing left at the end of the month. Emily @ Simple Cheap Mom recently posted..Is It Actually Cheaper To Buy A Used Car? I said that if we annualized our income over the last few months it would be $45,000. As in, if we earned all year what we have since September, we would be making $45k/year. So basically, enough to do what we need to do and save and give, but nothing extra. What do you think the potential not-spending on the little things adds up to, in comparison with the changes you’ve already made? For me, it’s all about cash flow or recent expenses. The biggest one is whether or not we are achieving our savings goals. We are nearing the end of the year and things are touch and go with our savings, which makes me feel broke. I feel pressure, from myself, to keep the flow of pennies to a minimum so we can hit our goal. I think I’ve avoided that anxiety by kind of redefining saving, which is cheating! We are keeping up our 15% into our Roth IRAs rule, but depleting cash at the same time. So its really just a rearrangement. I have to say the end of the year is a tough time to accelerate savings goals, so best of luck. How close do you think you’ll be without major efforts? I feel less of a need to be frugal when we have a ton of cash on hand. That’s why I’m always trying to sock money away in retirement, HSA, or college savings. When we are lowish on cash, I am more thoughtful with everything. Yes, seems to be the same as me. I wish we had the income to really use all our tax-advantaged accounts that we have available now that we’re not in school any longer. I don’t think there’s anything magical about getting married. I mean, considering how much money we spent on our rings, wedding, and honeymoon, getting married was actually a huge financial hit. The year we got married was the only year we’ve had since college that our net worth didn’t increase. A lot of people feel the need to upgrade their lifestyles after they get married, too. IMO the only people who experience a drop in living expenses when getting married (/moving in together) are the ones who were not really trying to reduce living expenses before they were married. Maybe in some cases getting married/having kids makes people (men) more responsible and that leads to more income success? Obviously it’s really difficult to study the effect of marriage itself on something like finances because you can’t randomize who gets married and who doesn’t. I don’t think I force frugality anymore. I also don’t think I’m *that* frugal either, until I compare myself to some of my friends who make similar incomes. I was pretty frugal in college, even though I managed to save up a pretty reasonable net worth by the end. I think that my net worth makes me mostly unstressed or anxious about money, which makes me a bit freer with my spending, but especially with my boyfriend moving in next year, my expenses aren’t that crazy high for my income at all and I don’t worry about large-ish one-off quite as much anymore so long as I have a plan to use them. I don’t think that income affects my frugality since I think of expenses very separately from income. You’re definitely spot on that the only people who reduce living expenses when they move in together are those who were not really trying to keep living expenses low before moving in – our combined annual housing costs living separately are about $44,000/year. We’ve tried to not think about that number and we made the decision to move in together when it made sense for our relationship rather than monetarily since we both make good money. Leigh recently posted..Can I pay my mortgage off in 2015? You think of expenses separately from income… that is interesting… I bet it is very different from most people who are trying to get their spending to end up on the right side of their income. I actually don’t focus much on expenses at all, mostly saving and then income, I think. Compared to many of my millennials, I have a reasonably high net worth, but my income always having been very low is what’s kept me frugal. I know how quickly my net worth would erode if I inflated my lifestyle. We are probably more frugal than we realize, really… So many years of practice has blinded us! I think debt forced my frugality, and really that’s more to do with cash flow, as others have mentioned above. I have an artificially low cash flow because of the large debt payment, but if I can keep it that way it’d be about savings. Sure I can loosen up a little bit when that’s gone, but I think it really comes into how much “extra” there is in my budget. I’m fine with how it’s allocated now, so I don’t “need” any of my debt repayment amount. I guess that is one ‘advantage’ to debt repayment, if any – if you can keep the mindset, it applies very well to saving. I would have to go with cash on hand. When I had low amounts of cash, I would become a little more frugal. As cash increased, my frugality dwindled. I don’t pay attention to my net worth that much. Grayson @ Debt Roundup recently posted..Is Amazon Prime Worth the Money? Sounds like we’re fairly similar in considering those savings over income changes. Like Leigh, I don’t really think of us as *that* frugal – aiming to spend ~$50K/year and it’s more of an ingrained habit than anything else. We have what we need and treat ourselves to a lot of small to moderate sized whims while checking bigger whims against our longer term goals before making a decision. We were the same way when we made less and we had smaller net worth, too I think. Cash on hand/in savings and my income are probably the highest factors in determining what I spend and how much. I’ve been on a tight budget lately and anxious about it, but I do feel a little better when I remember how much pre-tax paycheck gets socked away in my 401(k). Annie recently posted..the sky on fire. I love that out of sight out of mind saving strategy. It’s income, for both of us, and I think it relates to our experiences growing up. Liam grew up in an almost zero-net worth household (house was borrowed against for vehicle purchases) and spending decisions were purely based on weekly paychecks. In my household my parents paid for an advisor to manage their net worth and lived off of a monthly budget suggested by him. We’ve automated retirement contributions and debt payments and then live off of the remainder of our income. Because we’re both comfortable at the level we’ve been spending at it doesn’t feel like we’re ‘forcing’ frugality on a daily or even weekly basis. Though, it IS getting harder to resist lifestyle inflation as our friends abandon their grad school lifestyles on account of their fancy new salaries. Peer pressure at its finest! I’m glad that so far i haven’t observed any lifestyle inflation as we are still living in our grad school city. I think we will face that challenge when we move! I hour the blog will help keep us accountable. Agree with several above – cash on hand. Yes, I like to give all dollars jobs as well, but that is difficult in our current transition. I hope we’ll be back in a spending routine again soon. I think the “in-grained” idea you mentioned is very important: whilst you may not feel like you’re very frugal, if you compare yourself to others you would probably find you are because it’s a part of you, so it wouldn’t occur to you to splash loads of cash around for the sake of keeping up with the Joneses. It helps to be brought up in a frugal household of course. Myles Money recently posted..To Hell With Credit Cards This Christmas… Take The #PayCash Challenge! Ha, I wouldn’t know – my parents are not frugal! I grew up a SPENDER. I think it’s really helpful that I no longer compare my lifestyle to others’. It took me a couple years, but being on a grad student stipend forced me to accept that I’m running my own financial race and it’s different from everyone else’s. Basically, I can only compare what I’m doing now to what I was doing in the past, and I guess that’s why I feel less frugal, even if we objectively are. In the past, I think it’s been low income — I’ve dropped my spending when my income went down. But I was pretty much always spending what came in, no matter what. That’s interesting how your focus has changed. Yes, when you’re spending everything (and not going into debt), your frugal habits must change when your income changes! I think being frugal with the intent to raise your net worth must be much more gratifying than feeling like you have no other choice. Yeah, I think it was a mindset thing: “I’m in grad school, I’m in New York, obviously I’m going to spend what comes in!” I’m annoyed with myself in retrospect because I know I could have lived more cheaply and not only gotten out of grad school without debt, but probably even saved — even living in New York. But I made a bunch of choices during the last four years of my eight-year program that were not the healthiest financially and maybe not personally. Oh well, water under the bridge: I’m doing better now. But I’m psyched about your grad student finances seminar because obviously way more grad students take my mindset (“I will save after I graduate”) than yours (“well, why not now?”) and that needs to change, with programs taking so long and jobs afterwards so uncertain. Cecilia@thesingledollar recently posted..November update: even better! When I got married, that was the start of frugality, no more frivolous spending. I felt that I had low income so I looked for side hustles like blogging. Those are the trigger why I have become so frugal. Did you increase your frugal practices and side hustling because that’s how your wife is? Or did you start setting aggressive goals together? Congratulations on growing your net worth. Being frugal is now second nature to me. I know what I can and can not buy and no longer need to consciously follow a strict budget. I started being frugal because I used to run out money before the month end even though I was not making bad money. I did not even live pay check to check! It sounds like you’re in a great place now! What a turnaround – great job!